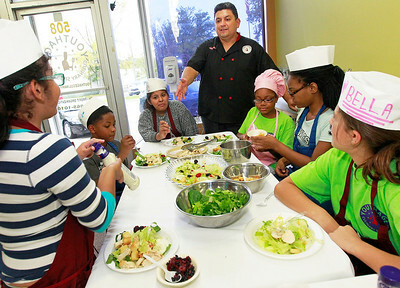 Candace H. Johnson-For Shaw Media Chef Mario Feijoo, of Wauconda talks with his students as they sit down to eat a tossed salad they made during "Salad Day" at Youthage Culinary Specialist in Mundelein. 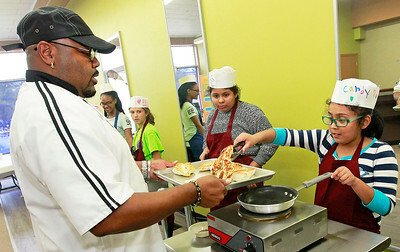 Candace H. Johnson-For Shaw Media Chef Robert Collins, of North Chicago collects a cooked chicken breast made by Candy Rangel, 9, of Mundelein and all of his students to be put in a chicken caesar salad during "Salad Day" at Youthage Culinary Specialist in Mundelein. 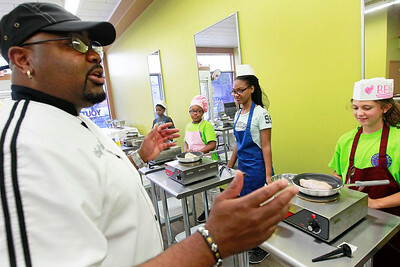 Candace H. Johnson-For Shaw Media Chef Robert Collins, of North Chicago explains to his students on how to cook a chicken breast on top of the stove to use in salads during "Salad Day" at Youthage Culinary Specialist in Mundelein. 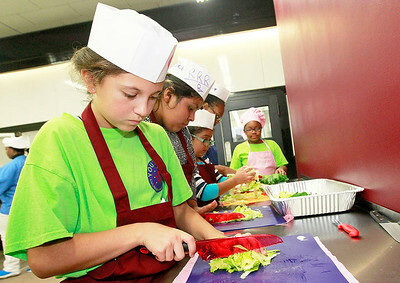 Candace H. Johnson-For Shaw Media Isabella Feijoo, 11, of Wauconda chops lettuce for a tossed salad during "Salad Day" at Youthage Culinary Specialist in Mundelein. 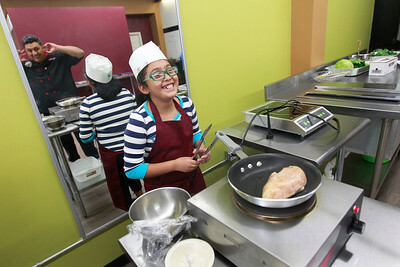 Candace H. Johnson-For Shaw Media Chef Mario Feijoo, of Wauconda shares a laugh with Candy Rangel, 9, of Mundelein as he instructs her on how to cook a chicken breast in the pan for a chicken caesar salad during "Salad Day" at Youthage Culinary Specialist in Mundelein. 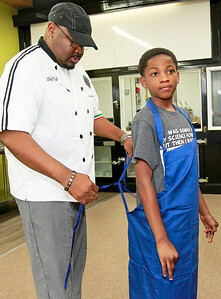 Candace H. Johnson-For Shaw Media Chef Robert Collins, of North Chicago puts an apron on Jayden Johnson, 9, of Waukegan before he starts to make a tossed salad during "Salad Day" at Youthage Culinary Specialist in Mundelein. 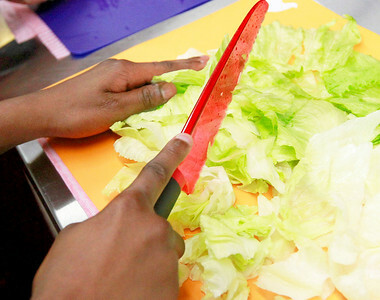 Candace H. Johnson-For Shaw Media Jayden Johnson, 9, of Waukegan uses a plastic, "child proof," knife while cutting lettuce for a tossed salad during "Salad Day" at Youthage Culinary Specialist in Mundelein. 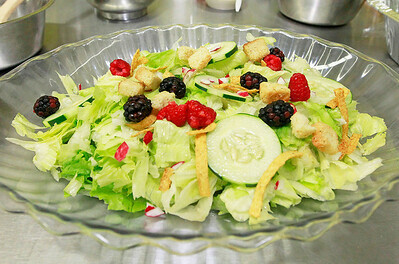 Candace H. Johnson-For Shaw Media A tossed salad made in the Junior Chef program during "Salad Day" at Youthage Culinary Specialist in Mundelein. 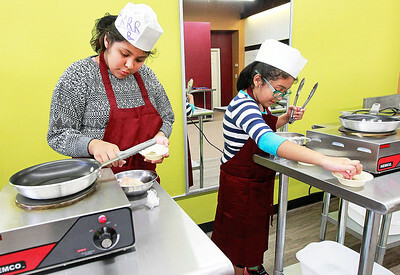 Candace H. Johnson-For Shaw Media Lisa Rangel, 11, of Mundelein and her sister, Candy, 9, season their chicken breasts before cooking them to put in a chicken caesar salad during "Salad Day" at Youthage Culinary Specialist in Mundelein. Jayden Johnson, 9, of Waukegan uses a plastic, "child proof," knife while cutting lettuce for a tossed salad during "Salad Day" at Youthage Culinary Specialist in Mundelein.